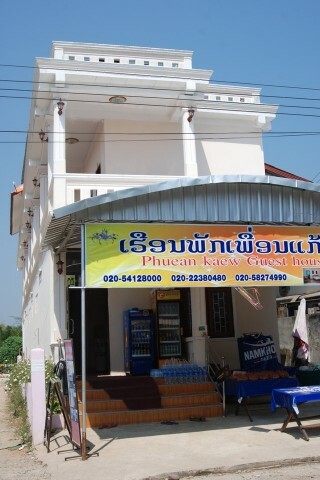 Just up the lane from the slow boat pier is Phuean Kaew Guesthouse 2, a new sparkling white two-storey building. The rooms are sparse and basic, but they do come with towels, drinking water and hot water bathrooms with Western toilet. Some rooms are spacious though quite empty feeling and one bathroom we saw had the toilet in the middle of the bathroom and the shower directly over it. Aside from the interesting bathroom design and construction, this guesthouse is nothing to write home about but it’s a good cheap option if you want to stay close to the slow boat pier.